Summon: Steal the top card of the opponent's deck and replace it with a Counterfeit Trinket. 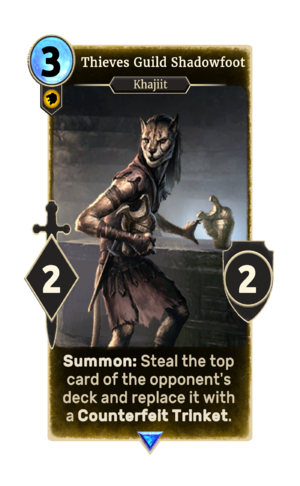 Thieves Guild Shadowfoot is a rare Willpower creature card. It is part of the Heroes of Skyrim expansion. "So many purses, so little time..."
"Khajiit is having a good night." This page was last modified on 27 February 2019, at 19:30.